Not everyone has an e-commerce site making $100k a day but it does help put things in a different light. For some people 7% can make or break your business and even if that is not the case most everyone would agree that improving your conversions by ANY amount is a positive thing. In addition to conversion rates Google has been taking page load time into account for its search algorithm for at least the past year. Google figures people don’t like sites that are slow so why rank them highly in the search results. So you get some small SEO benefit by having a fast site as well. Something that has been spurring a lot of advancements in page load optimizations is the big push towards mobile that has been happening recently. Think about the last time you looked up something on your phone. You were probably in a hurry or busy. You needed the thing you were searching for to come up instantly. If your website is slow to load on a computer its going to be even less successful in a mobile environement where time is even more critical. OK , I get it page load is important : Now what? The first step is to test your page load time. Simply loading it in a browser and seeing how long it loads is the most basic form of this, however if it is your own site you will probably not get accurate resukts doing this because of browser caching. 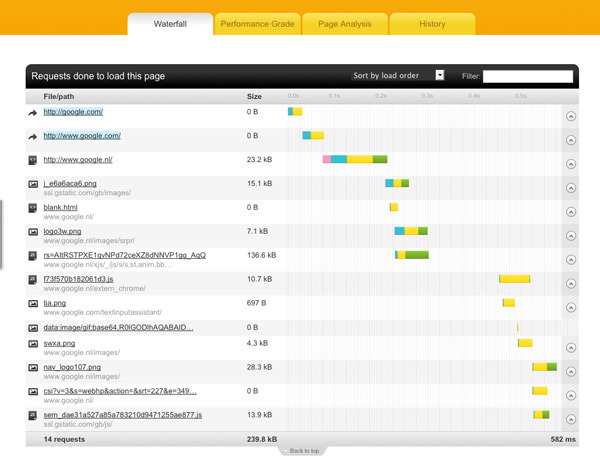 My favorite online page load time is this one from pingdom tools another great tool is yahoo’s yslow. This will give you a true reading of how long it takes your page to load along with some indicators about which parts of your site are causing the hold up. One thing to keep in mind is to test different parts of your site. Maybe your home page is fairly simply and loads quickly but your blog is full of high resolution images and other scripts that cause it to load pages very slowly. I like to keep my pages loading within the 2-3 second range if possible. For certain sites that are media intensive or graphics heavy this isn’t always possible but it is a nice goal to keep in mind regardless. This is something that can slow down your site even if you do everything else right and have the absolute fastest internet connection in the world. Basically every time you make a request its like a little tiny phone call to the web server, just like a real phone call you have to wait for the web server to pick up the phone. Then it figures out what resource you are asking for and THEN you can start using your worlds fastest internet connection to download it. The whole thing is only a fraction of a second but this is done for each and every picture, script, share button and css file on your page. It adds up quickly so be aware of how many requests you are making. There are two things to keep in mind with images. First make sure they are being optimized properly. 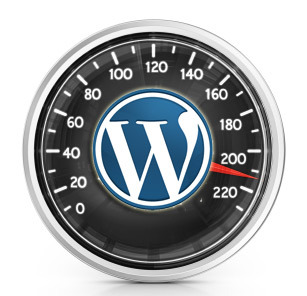 This plugin for WordPress makes it easy. http://wordpress.org/extend/plugins/wp-smushit/ If you prefer doing it by hand Photoshop is the obvious choice with the open-source image editor the GIMP being a great free altnerative. The second thing is related to the http request above. Try to keep it to a reasonable amount of images per page. If its a photo gallery try splitting up the gallery to a few different pages with pagination. If you decide you absolutely need a ton of images on a page just be aware that their is a downside to this. Without getting too technical caching just saves your web server the trouble of having to repeat itself and render the same page over and over again. WordPress has a number of plugins that make it very easy to setup but be aware that it can cause some weirdness in certain situations. If you enable a cache plugin on your WordPress site and notice anything strange like posts not updating even though you have made a change, the caching plugin is the first thing to check. Every web hosting company will tell you their servers are fast. To some extent this is true but if your blog is reaching a certain level of traffic and you have done a lot of optimizations on the site itself it may be time to look into your hosting setup. Most if not all inexpensive hosting plans from major hosting companies are “shared” accounts. They run a number of different sites on the same physical web server to save costs. Getting your own dedicated server or VPS can be more expensive but if your site has a lot of traffic its definitely worth the investment. If you have any questions about how to speed up your site or need help on any implementing any of the stuff listed above on your own site get in touch! One of our web professionals would love to take a look and speed up your website. other then SEO, page load matters to visitors as well, if page load faster, visitors will attract more. Excellent post. I get very pissed off when a facebook page, or any other page takes a lot of time to load. I will try and follow your advises and hopefully can reduce it. Part of the page load time issue is the hosting provider — are they limiting your site without you knowing about it? This is a very good articles. I hate waiting for pages to load and often just leave the the site and look elsewhere. Thanks Adam for the article. I have some issues with my domain host initially, but it seems they are alright now. There were moments when after posting or editing an article on my website, the whole domain seems to be inaccessible “suddenly”, and it occurred more than once! Even after numerous attempts to get a definite answer from tech support on what was wrong, I just gave up and hope that it (my website) would be up again. Getting a good and reliable host really matters!! Does page load speed really matter? Because, it’s 100% true… A slow site will generally convert less than a faster site, even if it’s just a second or two. Nice post – can’t over-egg enough the importance of getting to grips with website load time and speed, both from an SEO point-of-view and user experience.